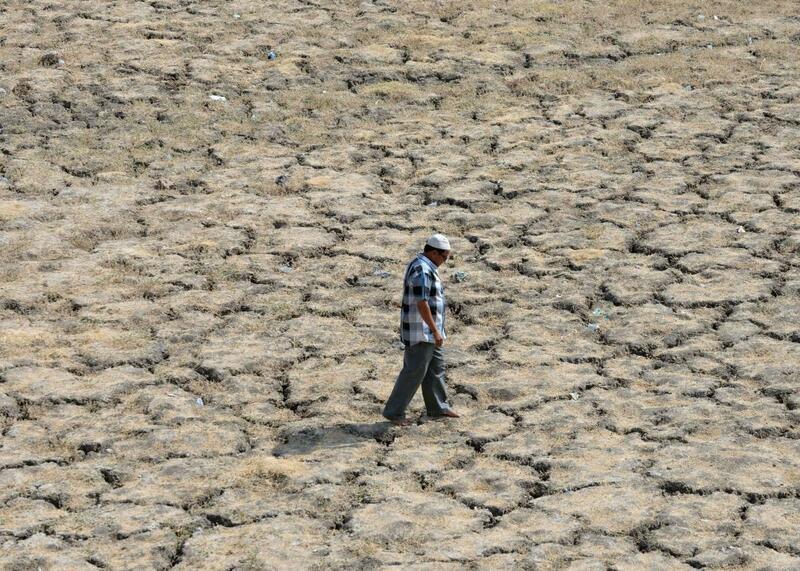 An Indian man walks across the dried-out bed of Lake Ahmad Sar in Ahmedabad, India, during a heat wave in May 2015. On Wednesday, scientists from the National Oceanic and Atmospheric Administration and NASA announced what everyone already knew: There’s never been a year like 2015, now officially our planet’s warmest year on record. The record was broken in spectacular fashion. According to NOAA’s data, last year’s global temperature topped the previous record (2014) by the widest margin ever—breaking the record for how much it was breaking the record by. There’s no other conclusion to draw from this kind of data: Our planet is getting warmer due to climate change, and that warm trend is accelerating. And, as it turns out, December 2015—which featured Christmas Eve barbeques and freakishly warm temperatures in the 70s up and down the East Coast—was the warmest of all. In both NOAA and NASA datasets, which use slightly different independent methods to compile temperature information, December 2015 was the most anomalously warm month of any month in any year on record—the first time any single month has reached the two-degree Fahrenheit threshold above pre-industrial levels. The record-setting data confirms a third global temperature dataset from Japan, which was released last week. Throughout the year, 10 months (including December) were record warm, and all five warmest single months on record occurred last year. The five warmest years on record have now all occurred since 2005. Though global temperatures have been consistently rising for decades, this year’s temperature surge was especially pronounced due to El Niño. A litany of extreme weather events sprinkled exclamation points throughout the year—all of which can be linked, at least in some small way, to the myriad ways our planet’s climate is changing. The year began with worsening drought in California—at one point, the state’s snowpack reached zero percent of normal. It’s increasingly likely that a multidecade megadrought is underway there. By September, the state’s wildfire season had broken records for the costliest on record. As bad as California’s year was, drought in Brazil and Puerto Rico and wildfires in Alaska and Indonesia were worse. Unfathomable floods hit South Carolina, Chennai, India, and the Mississippi River, and unprecedented cyclones made landfall in Yemen and Mexico. Heat waves in Europe and India killed thousands of people in May and June, and a profoundly disturbing warm front reached all the way to the North Pole as the year wound to a close. New developments in climate science last year demonstrated that a lot more extreme events like these will occur in the years ahead. In October, NOAA announced that a worldwide coral bleaching event had begun, and in July, James Hansen shocked the scientific community with a sea-level rise forecast for the coming decades far beyond what had previously been considered possible. Though official weather records only date back to the late 1800s, there’s ample evidence that 2015 was probably the warmest year over a much longer stretch of time, at least since the invention of agriculture more than 10,000 years ago. There’s also building evidence that the current supercharged El Niño—itself now the strongest ever measured—may have jumpstarted a decadeslong period of accelerated global warming, boosting the longer-term signal from humanity’s habit of burning fossil fuels. Despite the incessant reminders that we are living in a terrifying new era, last year also brought many hopeful signs that the politics of global warming are shifting. A new protest form—kayaktivism—was born in the Pacific Northwest and within months helped force a halt to offshore drilling in the Alaskan Arctic. Pope Francis and appeals from vulnerable Pacific Islanders and children helped reframe the sometimes wonky debate over climate policy into a human rights movement. As the 2016 presidential campaign got underway in full swing, Bernie Sanders held fast to his assertion, shared with the Pentagon, that climate change has become the world’s most important security threat. In December, after decades of debate, world leaders finally came to a comprehensive agreement in Paris designed to limit future emissions from every country on the planet, ushering in the beginning of the end of humanity’s fossil fuel use. In a warming world, even a year as crazy as 2015 won’t hold the all-time record very long. In fact, the still-strong El Niño will very likely ensure that 2016 will challenge 2015 for the top spot.